The Krill lights are en electronic alternative to chemical glow sticks commonly used in the military, camping and many other areas. The light is generated by electroluminiscence, no bulbs no leds, in the same way that a watch display glows. This means the lights provide a smooth 360 degrees ambient illumination without any beams or patterns. They are available in different configurations, you can get them in 360 degrees or 180 degrees beam, there is a "Extreme" version that is brighter than the regular one with a shorter runtime and there is also a shorter version called "mini". The regular version can run for about 120 hours with one set of batteries while the extreme version runs for about 50 hours. The available colors are red, yellow, orange, blue, white and green. The polycarbonate case with o-rings for sealing is extremely resistant and waterproof, the lights can be used up to 50 feet and will resist serious impacts and abuse. Compared to the chemical sticks the krill lights are less fragile and have longer runtimes but they are not as bright as the regular green light sticks, to our observes they were aproximately 75% of the chemical ones. 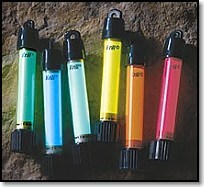 At a price of $25 to $30 the Krill lights are great tools as markers and soft illumination devices and require less care than the chemical lights, for normal use the "extreme" version is probably the best while the regular version becomes an option when you need extremely long runtimes. You can read more and check for dealres at the official website.